The key insight that makes the USIS concept viable is similarity in the loads and sizes of the payload interfaces on medium to large launch systems and the docking and berthing systems used in human spaceflight are very similar. So a single ring design could be the basis of a standard that can be used by both and would enable complete interconnectivity between all space systems. an international Standard which is future proofed for new applications like space tourism, and human missions to the planets. This vision, h as led to the generation of a set of provisional requirements (USIS Requirement Specification Draft Fb) that have captured current needs and capabilities, whilst also making best efforts to foresee future needs. None of the many existing docking, berthing or launch system interfaces can meet these needs, so a new design will be needed, but if adopted it could form the common element of all spaceflight systems for centuries to come. There have been several studies into how the USIS concept might be implemented showing that technical solutions do exist to meet the demanding USIS requirements. The Reaction Engines USIS was used in the SKYLON requirement validation studies. It had an had an interface ring which incorporates two seals and has an outer diameter of 1620 mm and an inner diameter of 1480 mm. 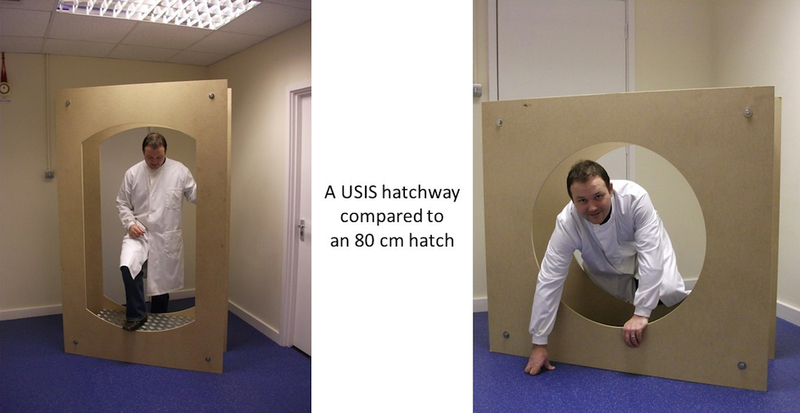 It does not meet the current USIS specification as the hatch size is too narrow and there is not enough mechanism redundancy. A more comprehensive concept design for the USIS has been produced by QinetiQ Space nv as part of the ESA study into a SKYLON-based European Launch Service Operator. This design is derived from the technologies behind the European Space Agency version of the International Docking System Standard. These technologies include a dual hook mating connection and the Stewart Platform mounted capture ring which compensates for misalignment and reduces the loads. The Hempsell Astronautics USIS has been produce since the ESA study to explore some of the conclusion that were arrived in it. It has a ring 1.6 m in diameter which as a lip suitable for either a marmon clamp interface or 12 mechanism based clamp connections. The final design will be determined after the requirements have been finalised by the USIS Association. However it is likely to be a ring connection between 1.5 m and 1.8 m diameter, with a clear passage way 1.4 m by 1 m and capable of carrying 10 tonnes on current launch systems. 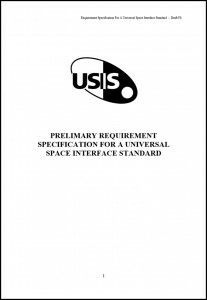 The USIS will also be able to be made in many versions with different technical approaches and level of complexity – yet all will be able to connect to all others.